OSWEGO, NY – The Child Advocacy Center of Oswego County invites you to join them for a great time for a great cause. 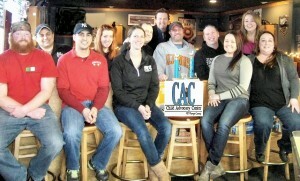 As part of the annual Warm Up Oswego celebration, the CAC will hold its fourth annual CAC Chicken Wing Fest. Karrie Damm, executive director of the Child Advocacy Center of Oswego County, meets with representatives from some of the participating restaurants in the chicken wing fest to discuss final preparation for the event. From left are: Rich Hall of Garafolo’s; Nick Canale of Canale’s Restaurant, Joe Garafolo of Garafolo’s; Amy Strong of the Oswego Ancient Order of Hibernians; Ali Scanlon of The Press Box; Gary Ingersoll of G.S. Steamers; George Broadwell; two-time Golden Chicken Trophy winner for best wings Sean Ohnmacht of Greene’s Ale House; Jim Guyle of Jimmie James BBQ; Kristen Aluzzi of Kristen’s Kitchen at Battle Island; Damm; and Robin Guyle of Jimmie James BBQ. Other participating restaurants include Bistro 197, Red Sun Fire Roasting Company, Office Tavern, and Alex’s On The Water. Scheduled for February 6, the CAC Chicken Wing Fest will be held at the Lake Ontario Event and Conference Center, East First Street, adjacent to the Best Western, from 6 to 10 p.m. with wings being served from 6 to 9 p.m. The wing fest will feature chicken wings from a variety of Oswego County’s favorite eateries. Each restaurant will offer samples of their signature chicken wings as they compete for the CAC’s Golden Chicken Trophy for the best chicken wing. Additionally, samples will be available for a wide selection of brews courtesy of Eagle Beverage of Oswego. Executive Director of the CAC of Oswego County, Karrie Damm, is looking forward to the event and is excited to once again be a part of Warm Up Oswego. In addition to the chicken wing and brew tasting, the event will also feature an “Attitude Adjustment Hour” from 5 – 6 p.m. followed by the main event from 6 to 10 p.m. featuring the sounds of local favorite John McConnell. All proceeds from the CAC’s Chicken Wing Fest will benefit the CAC and its efforts to serve children and their families affected by child abuse. “The epidemic of child abuse continues to plague Oswego County. With the support of concerned community members we can raise the awareness of child abuse and develop the resources necessary to allow the CAC continue its mission of responding to child abuse in ways that bring about healing and justice for children and their families, and working to reduce and prevent child abuse in our communities,” said Damm. Located at 301 Beech St. in Fulton, the CAC is a non-profit organization that works hand-in-hand with local law enforcement, prosecution, child protective services, medical providers, mental health providers, and victim advocacy professionals in Oswego County to protect and serve child victims of sexual and physical abuse. In 2014 the CAC served more than 400 children and families in Oswego County. Damm said that in the past year she has seen a trend develop in repeat offenders.